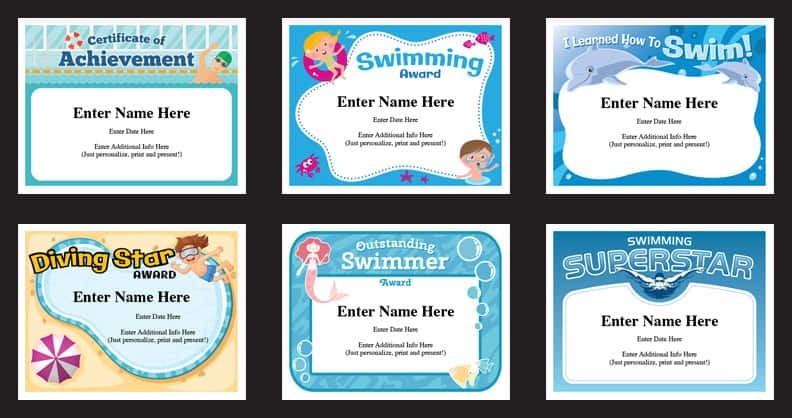 Make a SPLASH with these fantastic swimming certificates templates! Impress the swimmers in your family or club. These awards cover a wide age range and level of swimming expertise – from beginners to expert swimmers. The “Swimming Superstar” can be used for older ages – both boys and girls. The “I Learned How To Swim” certificate is great for swim instructors, swimming schools and parents of first-time swimmers. You can use them time and time again. With purchase, you’ll receive a link that will enable you to instantly download the PDF file featuring these 6 swim templates. PDFs work on Macs and PCs. Just make sure you have the latest version of Adobe Reader (which is available for free). Type in name, date, swim coach and other details into the text fields. Personalize, print and present! It’s that easy. From first time in the water participants to swimmer who have mastered every stroke, there’s something for everyone. These printable certificates are easy to use. The designs are so much better than any free certificates. These swim certificate templates for kids make great awards. Recognize achievement, build confidence and capture important moments with these swimming awards. You’ll put smiles on both kids and parents faces when you award these. The stylish, contemporary designs will look good wherever a kids might post them, be it a bedroom, on the bulletin board, or in the kitchen on the fridge. When should they be awarded? Some parents and coaches like to make the awards immediately after a big accomplishment. If your son or daughter is part of a swim team, they can be awarded at a team party. Many coaches in all sports make awards throughout the season to keep children engaged and to build self-esteem. Kids perform best, and practice harder when they have a lot of confidence. These awards will help build that confidence! If you find swimming to be challenging at your house, some recognition might have your kids looking forward to lessons. Many of these awards serve as certificates of completion. Check out Sports Feel Good Stories awesome list of swimming slogans and sayings.